It has been a week of non-stop rain here in California. I am ready for sunshine and flamingos!! When I saw this Mandie Bee Ella Top in Pink Mingo print on the Heart of Haute website I could not wait to get it on my body. Pink flamingos on a work appropriate blouse is not something you are lucky enough to find everyday. I paired the Pink Mingo Ella top with a simple black circle skirt and it looks great with a white or pink cardigan added for a little warmth and perfect for the office. For reference I am wearing the top in a 2xl to accommodate my large breasts and I love that the fit is perfect for very curvy gals while not being too extreme and that is why this is my new go-to top for the office . The pussybow adds the right amount of chic femininity too!! 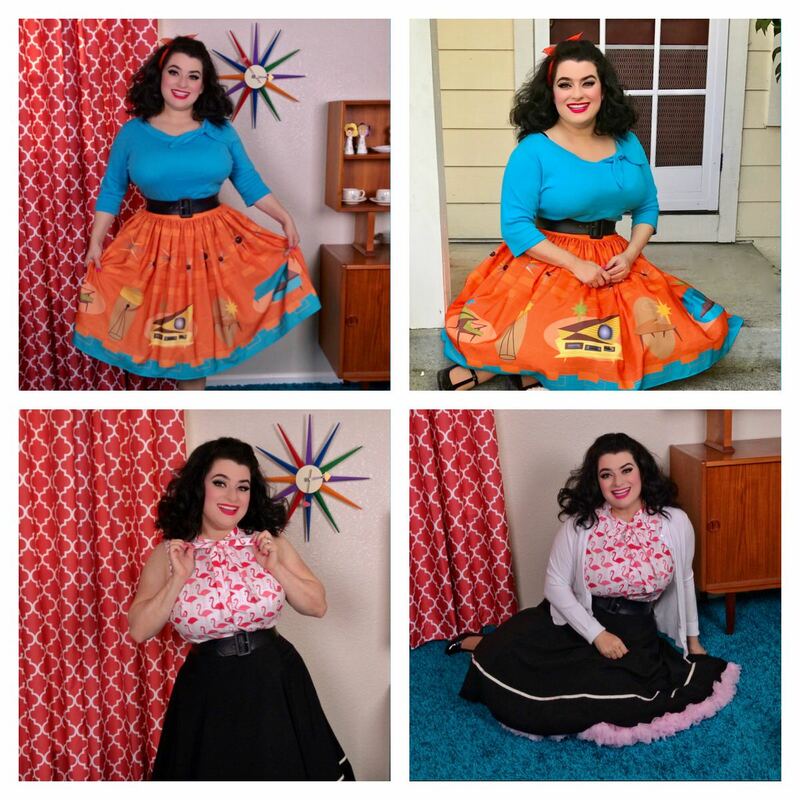 Next up is the colorful MCM Furniture Novelty Print skirt from The Oblong Box Shop. The brilliant orange and teal colors just pop and I love the mid-century modern boomerang coffee table, sputnik clock, 50s sofa and TV on this print. I paired the skirt with my favorite turquoise blue Lily top from Heart of Haute. It is such a fun outfit to wear!! I wear the MCM print skirt in a XL and the Lily top is an XL too (lots of good stretch). My hubby Gary is a great photographer and we have a lot of fun working together on these Pinup shoots. 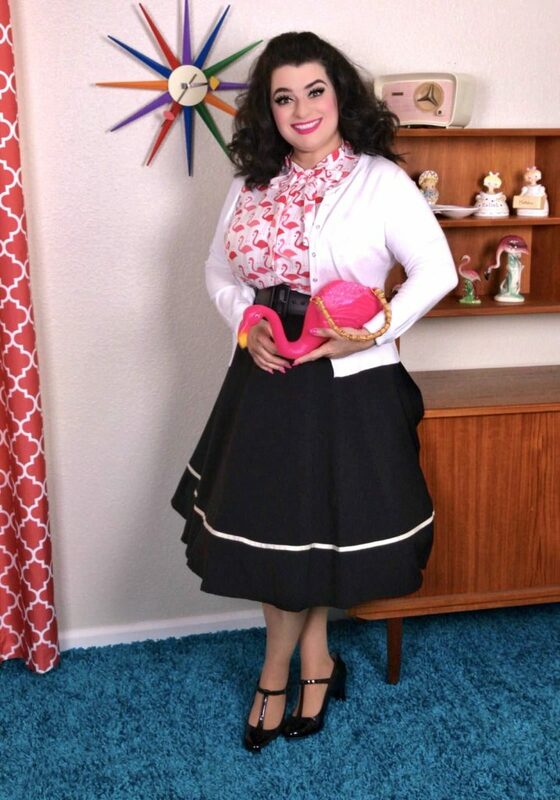 Gary is also a great photo stylist and put together the Rockabilly Pinup set for this shoot that includes a George Nelson Mid-Century Modern style wall clock and the Danish modern cabinet with a shag rug and mid-mod drapes. I loved this set so much. Accessories on the shelves are from our collection. Next week we have a fun Valentines Day shoot and I can’t wait to share the pics with you all.